The dark skin pigment melanin protects against the sun's damaging rays by absorbing light energy and converting it to heat. 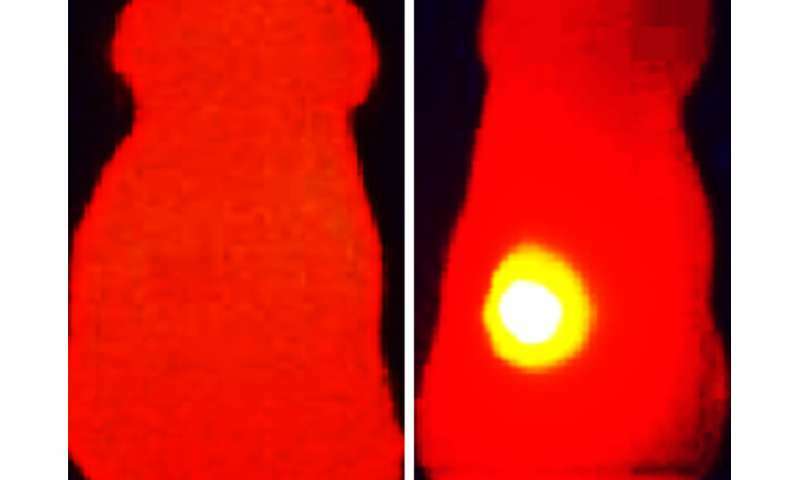 This could make it a very effective tool in tumor diagnosis and treatment, as demonstrated by a team from the Technical University of Munich (TUM) and Helmholtz Zentrum München. The scientists created melanin-loaded cell membrane-derived nanoparticles, which improved tumor imaging in an animal model while also slowing the growth of the tumor. Dr. Vipul Gujrati, first author of the study, explains the principle: "Melanin absorbs light very readily—even in the infrared spectrum. We use this light in our optoacoustic imaging technique for tumor diagnosis. It simultaneously converts this absorbed energy into heat, which is then emitted. Heat is also a way to combat tumors—other researchers are currently exploring this method in clinical trials." Optoacoustics, a method which has been significantly advanced by Ntziachristos, combines the benefits of optical imaging and ultrasound technology. Weak laser pulses gently heat the tissue, causing it to briefly expand very slightly. Ultrasound signals are produced when the tissue contracts again as it cools down. The measured signals vary depending on the tissue type. The scientists record them with special detectors and "translate" them into three-dimensional images. Sensor molecules or probes (such as OMVs) can improve the specificity and accuracy of the technique even further. "Our melanin nanoparticles fit into the new medical field of theranostics—where therapy and diagnostics are combined. This makes them a highly interesting option for use in clinical practice," says Ntziachristos. The scientists will now develop their OMVs further to bring them into clinical use in the future.